The global generic drug market is growing at a CAGR of around 10.8% and is expected to reach approximately USD 380.60 billion by 2021. Yet, Indian pharmaceutical companies are currently experiencing tough times. Pharma stocks in India have been de-rated by 10% in the last year; a further de-rating is expected in the coming years. This state of affairs is the mostly ascribed to changes in the US generic drug market. North America is largest market for generic drugs where more than 88% prescriptions are filled by generic drugs. Stringent FDA approval norms regulate the entry of drugs into the American market. However, with the enactment of 2012 Generic Drug User Fee Act (GDUFA), which sought to streamline1 and speed up the generic drug approval process, the ANDA approval rate from the US FDA has increased. This has proven to be a mixed blessing for Indian pharma companies. While more of their new generics are making the cut, they are also facing severe price erosion of their portfolio. Price erosion2 , a natural phenomenon after patent expiry of branded drugs, was largely stable at three-four per cent over the last nine years. But it has increased to seven-eight per cent due to higher competition after the rate of FDA approvals increased. Therefore, in this difficult generic pricing environment, revenues and profits of pharma companies are under tremendous pressure3. The key challenge for generic drug manufacturers is to ensure that new products are quickly (as close to patent expiry as possible) and continually launched, not only to take care of the company’s need to grow but also to make up for this relentless price erosion. Depending completely on development of specialty drugs is a risky proposition since these drugs are difficult, expensive and time-consuming to formulate. Even some well-known drugs like Daraprim (pyrimethamine), Advair (fluticasone/ salmeterol), Seromycin (Cycloserine)4, etc. are yet to gain generics though their patents have expired many years ago. Similarly, re-innovation (i.e. 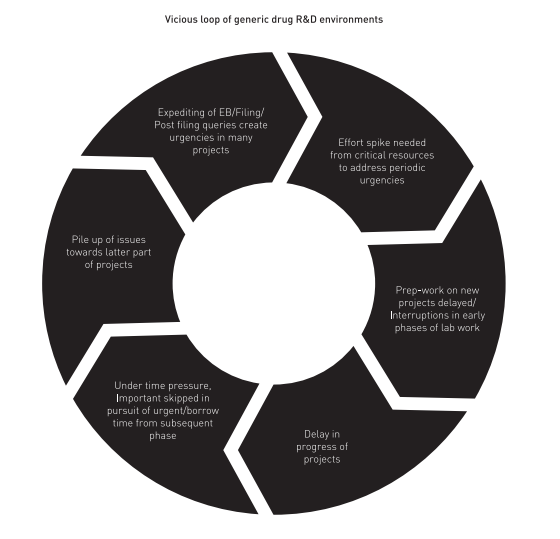 creating value added generics), like for instance improving drug delivery, also makes the process of R&D highly uncertain. So, most companies prefer to maintain a mixed portfolio of products in the R&D pipeline – a mix of standard generics and innovative or specialty generics. The second strategy of continual recruitment to expand resource base is seen as a necessity by most companies in this business. But this approach has its own pitfalls. In addition to the industry’s high attrition rate, there is always a time lag between the requirement for resources and actually having them on board. And while it might be possible to hire more lab technicians or to buy equipment, crucial resources are not easily scalable. Therefore, while the head count is as per the expected industry benchmarks, there is always paucity of experienced, skilled personnel. This mismatch between capacity and load becomes evident towards the end of the second quarter and the fourth quarter in most generics R&D environments; during this time there is a significant spike in efforts demanded from critical resources. At the end of the second quarter, key analytical and formulation resources will often be hectically working to ensure that projects reach Exhibit Batch (EB) stage at least by end of September (to meet the mandatory stability test requirement before the targeted year end completion). This leads to a huge skew of EB load in this month. And in quarter four the same resources would be stretched out trying to help the documentation and regulatory departments complete the residual work post EB – by addressing documentation gaps, answering queries, etc. Moreover, because submissions happen with a skew, FDA responses also arrive in a skew (as per FDA internal SLAs). And since each FDA query has to be answered within fixed time, there is again a spike of load on key resources. Thus, in some part of the year EB becomes urgent, in another submission and then followed by a spate of FDA queries– all to be addressed by the same set of resources. In these phases, when key resources are busy elsewhere, projects which are in early phases of lab work get neglected. The preparatory work on new projects typically comes to a standstill. Consequently, the launch of many new projects is delayed. So, when projects are eventually taken up for lab-work, they are often already behind their expected schedule. Frequent interruptions create further delays. Since projects are tracked based on date commitments, there is always a pressure to move them into the next stage in the process. So, for instance, though the prep-work may be incomplete, in a bid to catch up with the schedule, work is initiated with only partial information or material in place; changes in formulations at times, are not in sync with AMD (Analytical Methods Development) and yet they may be passed on to Validation without complete check or fine-tuning. Or the dossier preparation may be full of gaps. Moreover, with many projects behind schedule, every task becomes urgent. This leads to daily firefighting and multi-tasking. Important tasks are often skipped in pursuit of the urgent. Consequently, by the time projects reach EB, not only are they significantly delayed, there are also a large number of issues piled up which should ideally have been sorted in the earlier stages. But at this point, the substantial investment needed in the form of the large amount of API for EB, brings these projects into the top management’s focus. Moreover, they can now potentially be targeted for filing by the year end. Consequently EB and post EB (residual work for filing/ addressing FDA queries) sees considerable expediting. This forces everyone to drop all lab work and focus the urgent tasks at hand. 1. 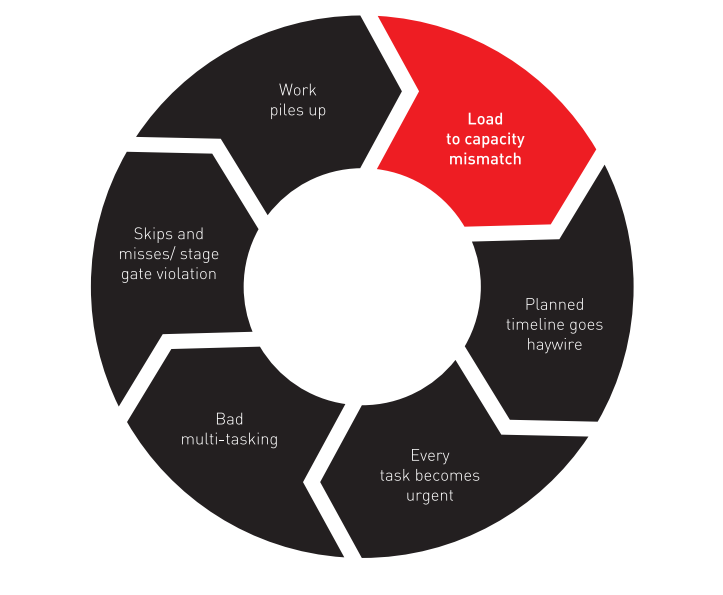 One can match load to capacity by effective planning because capacity can be well defined. Most companies have also invested in project management tools which are based on these assumptions. But in most R&D environments, these tools either had to be abandoned or only used to record post facto delays. Experienced practitioners in the industry realize that these assumptions do not hold true in reality and that capacity definition and task predictability are in fact mere myths. : Task times needed vary considerably based on proficiency level of resources and level of uncertainty involved. For example, a highly experienced formulation scientist can reach the same result with almost half the level of iterations needed by a less experienced one. Moreover, uncertainty can also make the timelines go haywire. These conditions make it difficult to define a deterministic capacity level for any resource group. So, number of resources doesn’t really reveal the actual capacity. : Since resources are shared across projects, any delay creates a cascading of queuing delays across projects. This makes queues highly unpredictable before resource groups. When there is no predictability of queues, task level commitments and predictions go haywire within no time. Therefore, the only practical solution which can work in this environment is one which accepts the above realities as unchangeable facts of any R&D environment. And in order to ensure that projects are completed with significantly lower lead times, the traditional solution of finite capacity and time scheduling has to be given up and one has to manage R&D projects using principles of flow management. Having incorrect capacity definition in planning leads to the problem of either having too less or too many projects. In most companies, it tends to be the later, because people assume that while there is a price to be paid for undertaking fewer projects (underutilization), there is no additional penalty on capacity utilization when the system is overloaded. This assumption invariably proves to be incorrect. Interruptions to flow are inevitable if the system is choked with too many projects and expert resources find themselves under pressure to work on more than one task across projects. Limiting active projects in the system and putting a rule of only allowing a new one to be taken up when any one currently being worked upon is completed can ensure that the number of projects in the system does not stretch the bandwidth of these key resources. If the current environment is that of rampant urgencies and priority changes, this is an indication of an overloaded system and the WIP levels have to be reduced significantly. Further a global priority mechanism can create a common understanding of what is truly urgent. Projects can be given a sequential queue number and tasks can be picked up in the order of their queue numbers. This can ensure that the right projects get worked on and that there is synchronization between various departments. The sequential queue number remains fixed throughout the duration and hence works as a better priority mechanism than the traditional “variance from planned date” based priority system. Since plans go haywire within no time, there is no way to achieve synchronization by doing a “required by date” planning. Hence starting work without complete information, with the hope that remaining information will come through just in time when it is actually required does not work. Often the resources providing the information may have moved to some other project or the required by date would have undergone a change because of variability. Hence disruption of work is unavoidable if the full kit of information, materials and approvals are not available beforehand. But when WIP is reduced, the time spent in waiting for WIP levels to go down provides ample opportunity to ensure that all preparatory work for the new ones are ready, provided there is a separate preparatory team doing the job. Further, implementing a full kit rule also implies that no phase of R&D can start unless the previous stage gate requirements are completed in letter and spirit. But since a lower WIP also takes away the pressure of time, this enables one to follow the rule of gates without the need to violate it. Embracing rule of “one-out-then-one-in” and daily management inevitably means letting go traditional project planning methods of task level estimates and commitments. However these task deadlines provide visibility to the progress of a project. So, if these plans are dismantled, an alternative method is needed to ensure visibility and control of the overall project. This can be done by creating a project buffer tracker which does not use task level deadlines but yet provides better project level predictability of completion. For this, one needs to differentiate between touch time (the net value added time without interruption or rework) of doing a task and the buffers that tend to be added. 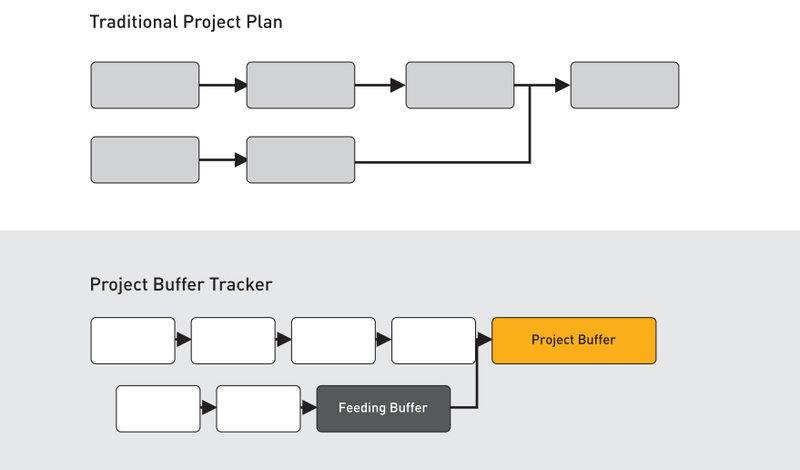 Once they are segregated, the buffers from tasks can be aggregated as one single project level buffer. Whenever, a task exceeds touch time due to uncertainties, it will consume this buffer time making the progress of the entire project visible to everyone in the organization. By tracking the rate of this buffer consumption vis-à-vis the work completion, the company can now track all the projects in the company’s R&D pipeline and take expediting/corrective actions wherever judicious. Once these processes are institutionalized, their combined effect is a dramatic release of capacity and reduction in lead time. This will not only enable the company to continually increase FDA submissions and earn higher margins; it will also simultaneously destress the entire process and build a happier work place. 1Hatch-Waxman act 1984 created the original regulatory path for generic medicines Generics life cycle is governed by laws of demand and supply. 2More suppliers enter as the market for generics mature, leading to lower prices and lesser margins for all players.